Who Has Two Thumbs And Can’t Sew? Then I cut around it. The shirt wasn’t wide enough to allow me to completely follow the flair of the skirt. I just kind of trimmed the seam after I ran out of shirt. In hindsight, I probably should have just whacked off the excess, but I don’t really know what I’m doing so I just did the first thing that came to mind. Then I spent longer than I’d care to admit before the instructions “pin right sides together” made sense to me. Like I’ve never seen that instruction before. Apparently, you put scissors and a needle in my hand and I turn dim. 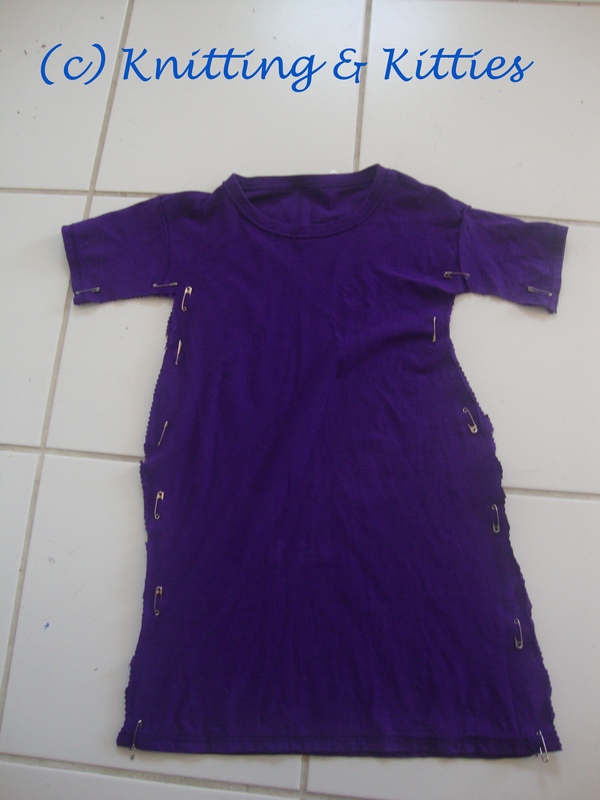 Once I had my ah-ha moment, I pinned the cut up shirt together and sewed up the seams while watching Sunday Night Football. Since I don’t have a sewing machine, I stitched the sides up by hand. The stupid thread kept getting caught on a button on my pants. There was much cursing, but I did eventually get everything together. This dress isn’t going to win me Project Runway. I’m convinced Michael Kors would say the crotch looks crazy, despite this being a dress. He’d probably be talking about the armpits. I tried it on BabyLiu tonight. It goes over her head and she can get her arms in the sleeves. Hurrah minor victory! It totally looks like a nightgown, though. 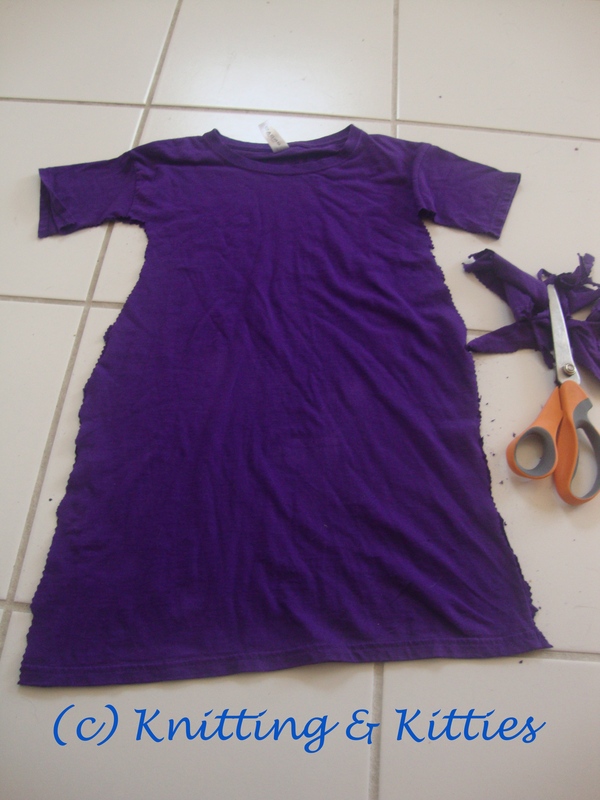 What I’m planning to do next is add strips of the light purple to the ends of the sleeves and cut about seven inches of length and stitch the light purple to the bottom. I’m hoping that will make it more Daphne. If this plan is crazy cakes or you know a super clever way to go about it, please let me know. 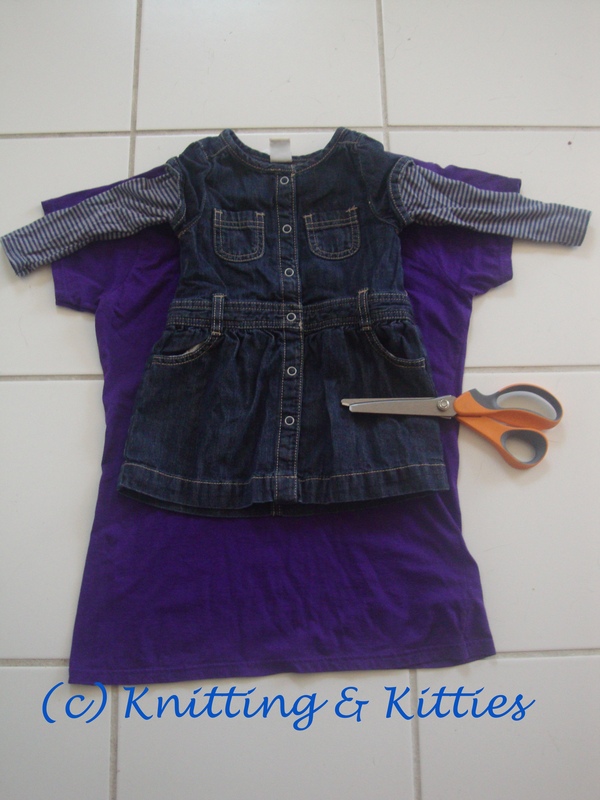 This entry was posted in Baby, Holidays, non-yarn craft. Bookmark the permalink. 1 Response to Who Has Two Thumbs And Can’t Sew? This is good!! And your plan sounds good to me. 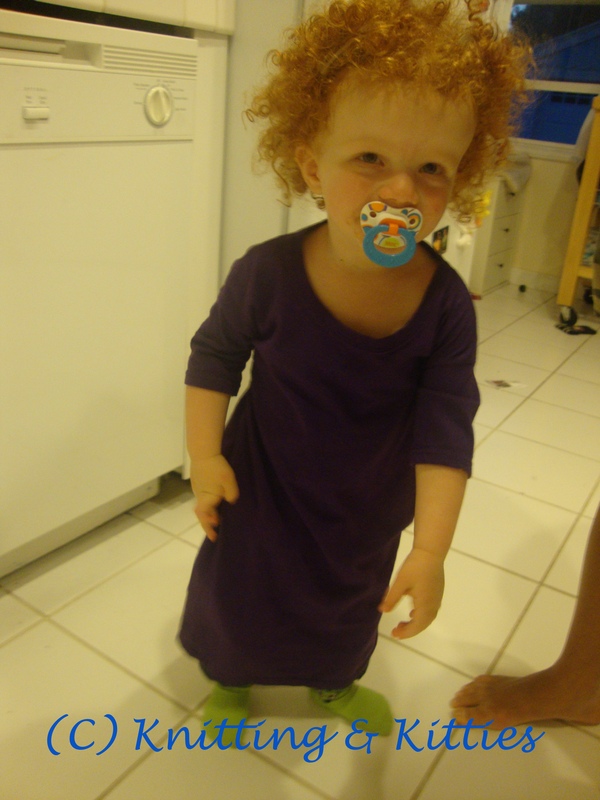 Daphne had a slimmer, A-line dress anyway so you don’t want it as wide as the dress you used for your pattern anyway.